First, “real world” journalism is not some ethics-free zone. As with any profession, there are reporters who strive for the highest ideals of journalism and there are those who bleed society for their own gain — compare The Economist’s writers to the paparazzi. It is worth distinguishing between them, because characterizing The Wall Street Journal or LA Times as unethical or immoral is blatantly inaccurate. Second, Middleton might make this mistake because he thinks reporters should take the official answer as the final word: if the IFC thought the reporter’s questions were inappropriate, then the reporter should stop asking them. Obviously, this is exactly what the press did concerning the White House’s claim that Iraq had weapons of mass destruction. Oops. So while the IFC may be offended that someone would question its official statements (or non-statements), it should accustom itself to a basic principle of journalism: trust no one, and verify everything. Because even at MIT, with its “higher standards,” people still have agendas, cover up mistakes, and act incompetently. Perhaps Middleton meant that MIT should have one standard that is missing from the world at large: patience for each other’s mistakes. 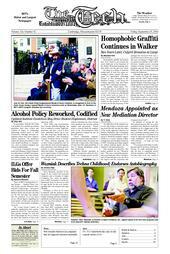 Sterner was The Tech’s editor in chief from mid-April 2004 to Jan. 2005.